InvestoFin - Finance Club of JIMS organised a session on “NSE’s certification in Financial Markets” on 19th November 2015,for the students of PGDM – General, International Business and Retail Management. 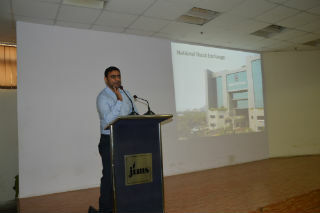 The session was conducted by Mr. Kunal Tyagi, Assistant Manager Business Development,National Stock Exchange. The session aimed at providing insight on the capital market and relevance of the NCFM Exam. 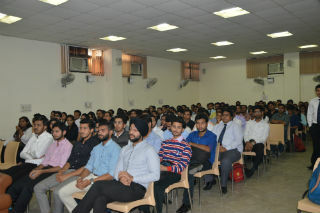 200 students registered themselves two days prior to the session and showed active participation. The session started with a brief introduction on the setup of National Stock Exchange and evolution of Demat System in India from physical markets which prevailed in 1992. Then the discussion moved on to different types of financial markets and the parties involved in the stock exchange transactions. Later on, practical illustration of trading window was shown to explain how the whole trading transaction executes. In later part of the session, discussion was done about NSE’s certification in financial markets and it’s benefits for the students. This certification adds value to the students profile who aspire to flourish in the fields of finance and marketing of financial products/services. It also aims in enabling students to demonstrate their knowledge relation to financial markets, which improves their chances of getting employed in the area of finance and getting equipped for a career in 21st century. 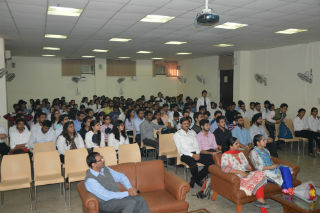 Students were enthusiatic in asking queries during the session related to capital market and NCFM certification. 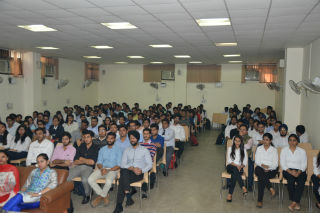 Overall, the event was very well appreciated by all students and faculty members.